Stouffer's Chicken Paremesan consists of savory marinara sauce, Breaded Chicken and is topped with a blend of cheeses including Mozzarella, Parmesan and Asiago. No Preservatives. Made with Real Cheese. Keep frozen and immediately before consumption, cook via convection oven, conventional oven or microwave. No preservatives. Excellent source of protein. This product pairs well with a side salad of spring greens. In 1922, Mahala and Abraham Stouffer started a tradition of delicious food that has guided us for almost 100 years. At Stouffer’s, real food means real ingredients, crafted into customer favorites by chefs in a kitchen like yours, only bigger. Where our products are freshly made and simply frozen, and include a wide range of options such as freshly-made pasta and real cheese, as well as vegetarian, gluten-free, and whole grain offerings. Explore the easy-to-serve possibilities with simple, consistent scratch-made taste you can be proud to call your own. Create a specialty sandwich; serve on a warm Kaiser or Hoagie roll, or top with extra sauce and serve open-face. Storage Temperature: Frozen &lt; 32°F. Shelf Life in Days: 720. 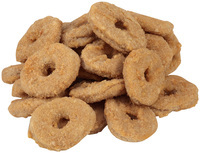 Tyson® NAE, Whole Grain Breaded Golden Crispy Chicken Rings, 0.74 oz. 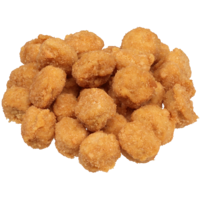 Tyson® NAE, Whole Grain Breaded Golden Crispy Popcorn Chicken, 0.28 oz. Tyson® NAE, Whole Grain Breaded Hot 'N Spicy Chicken Nuggets, 0.69 oz.